Chopped Salad with Strawberries is a hearty salad filled with fresh vegetables, two kinds of lettuce, strawberries, croutons and is topped with a delicious vinaigrette. I love salads. I especially love to order large salads when I go out to eat, so I decided I need to come up with some restaurant quality salads at home. Chopped Salad with Strawberries was a big success. I opted for two kinds of lettuce, mixed greens and iceberg lettuce. I love the crispness of the iceberg lettuce with the mixed greens. For vegetables I used a sweet red pepper, a shallot, and a seedless cucumber. I added in fresh strawberries, feta cheese and home made croutons. For the dressing, I made a home made herb vinaigrette and used a strawberry vinegar. I love vinaigrette’s, they are so easy to whip up and are way better than a store bough salad dressing. Trust me, it’s worth the time to make a home made vinaigrette. I am looking forward to creating more salads! Arrange the lettuce, veggies, strawberries and cheese in a large bowl. Whisk together all the ingredients for the vinaigrette and pour over the salad. Use a 1/2 loaf of day old bread, french or italian loaf works great. Cut the bread into large chunks and add to a baking sheet. Drizzle some olive oil over the bread chunks and sprinkle with salt and pepper. Bake at 375 degrees for 10-15 minutes. Keep an eye on them, you don't want to over bake the croutons. Lots of lettuce and vegetables. I made this recipe for Hearty Beef Vegetable Soup for a Lunch & Learn at work. Within a half hour the soup had vanished and I even doubled the recipe. I got rave reviews on the recipe. I promise it’s good, you should plan on making it soon! You start this Hearty Beef Vegetable Soup with ground chuck and bacon (nothing is bad if it has bacon in it) and you add in a ton of vegetables along with cheddar cheese soup, beer and beef broth. The beer really adds a depth of flavor but if you prefer not to use beer you can add in an extra cup of beef broth. Adding the milk in the end makes the soup creamy and mellows out the tomatoes in the soup. 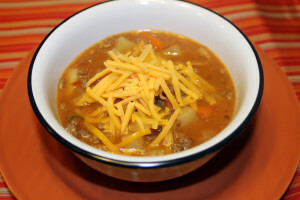 Add cheddar cheese when you serve up this hearty soup. Enjoy! Add some cheddar cheese if you please. Cook the ground beef in a large sauce over medium high heat. Add salt & pepper and cook for 10 minutes or until cooked through. Drain the grease off the meat and set aside. Add 1 tbsp. olive oil to the pan and add the onions, carrots and celery and sauté for 8 minutes. Add in the soup, broth, beer, bacon, beef, potato, mustard, worcestershire sauce and tomatoes, bring to a boil, reduce the heat and simmer until the potatoes are tender, about 15 minutes. Add in the milk and stir to combine. Taste the soup and add salt and pepper if needed. Serve the soup and top with cheddar cheese if desired. You can substitute beef broth for the beer. Kale is a very potent vegetable, full of vitamins and nutrients. The key to get more of this veggie into your diet if you are not a fan of it, try hiding it in some of your favorite recipes. This slaw salad is the perfect recipe for this. One thing to remember when working with kale is to remove the long stem along the spine of the kale. Place slaw (or broccoli), kale, kohlrabi and noodles in a bowl and set aside. In a separate bowl, whisk Ramen seasoning packet, oil, water, sugar and dressing until sugar is dissolved. Pour over salad. Mix thoroughly. This salad is best when it has time to sit so the flavors come out. I usually add the sunflower seeds and almonds right before it is served so they don't get soggy.